The World Championship match between Magnus Carlsen and Sergey Karjakin begins exactly one month from today in New York. At a recent press conference in Russia the challenger stated that, “If Carlsen wants to beat me he needs to show the best play of his life”. Most commentators think he may have got it the wrong way round. Karjakin gave an interview recently which you can find on http://www.chess24.com. 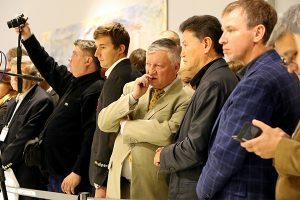 This is handy because if you want to know more current Karjakin news, it is best to avoid the link http://www.sergeykarjakin.com/ which will take you straight to the Carlsen website, the domain having been bought by Team Carlsen according to the Karjakin camp. Carlsen is already in New York while Karjakin flies to his Miami training camp next week. Both players achieved similar scores at the recent Olympiad until the last round when Karjakin came a cropper. The highlight of the match, and possibly of the whole season, was Mike Doyle’s splendid win on board 7. Stop reading this and go to Game of the Week to play it through! Not bad, eh? Anyway, Mike’s win put us 1-0 up and then Bob P accepted a draw to make it 1½-½. At this point it looked as though we might even get a result as Nick on board 2 had enough advantage to turn down a repetition and we weren’t doing badly on boards 1 and 5 either. Unfortunately looks proved deceptive and all of the remaining five games ended up as wins for Bridge. Still, all of the Broadstairs players put up a good fight against higher-graded opponents and nobody has any reason to be disheartened. Congratulations to Bridge on their well-deserved win and thanks, too, to all the Broadstairs players for playing and especially to the two Bobs for driving. The match got off to an unusual start. At 7.30 none of the Broadstairs players were present, and neither was the Herne Bay captain and board 2, Bob Pooley (due to a domestic emergency, we found out later). The first four Broadstairs players turned up about 7.40 and the match began, with Herne Bay shuffling their boards 3-7 up one and fitting in a replacement on bottom board. The Broadstairs stragglers turned up 10 minutes later. On board 7 the game set off at a furious pace, as if to make up for the late start, and by 8.25 Bob C had taken his “Harry the h-pawn” in for a touchdown to score the first point for Broadstairs. Reg on board 6 scored our second point about an hour later, cashing in a cleverly-built-up positional advantage to win a whole rook. At this point the match looked very promising, and it soon got even better as John on board 4 neatly won first one piece and then a second. 3-0 then became 3½-½ as David on board 1 defused a dangerous situation to secure a draw. All we needed now was another ½ point from the remaining three games to win the match, but we were made to wait as all three games went past the first time control (36 moves in 1½ hours). Finally Nick on board 2 seized a chance to run his “Harry the h-pawn” up the board. This Harry never actually made it home to queen but the distraction it caused left one of Nick’s other pawns free to advance on the other side of the board and that was enough to win the game. 4½-½ then became 4½-1½ as Andy on board 5 lost and then there was just the one game left. Bob P on board 3 had a good position, but he was low on time. In a brave attempt to win this Bob followed the other Bob’s example and ran an advanced pawn up the board, but this one sadly got a little bit too frisky for its own good and ended up surrounded in enemy territory and captured. Bob was unable to survive the material loss and the match ended at 4½-2½ to Broadstairs. A very welcome success (as Herne Bay usually beat us) and hopefully a good sign for the matches to come. Many thanks to everyone that played, and especially to Nick and John for doing the driving. Broadstairs Chess Club celebrated another successful year, it was reported at the AGM on Monday. There was an array of trophies to be distributed from both internal and external competitions. Congratulations went to the Walker Shield (U115) team for retaining their trophy and for maintaining a 100% record over two seasons. Broadstairs also won the Hargreaves Shield (U140) with five wins out of six, and the Thanet Shield for the best overall league record between the three Thanet clubs of Broadstairs, Margate and Ramsgate. On the domestic front, David Horton left the club on a high note by sharing (with David Faldon) the premier trophy, the Goodall Cup and won the George Stiggers Trophy for the highest grade improvement. David first won the Goodall Cup in 1966 and it is encouraging for chess players the world over if he can still be winning it fifty years later and be crowned the club’s most improved player. 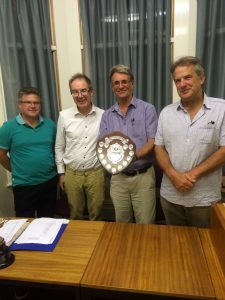 Other trophy winners were Reg Pidduck (John Cutting Cup and Oyster Shield), Andy Flood (Richard Pilcher Prize), and Reg Pidduck and Michael Doyle (Zielinski Shield). 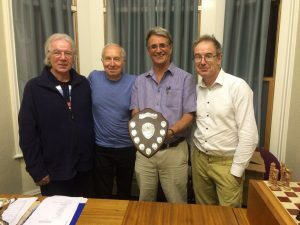 In his report of the season, the Secretary Bob Page said that in a difficult year for Thanet chess in general, it was encouraging that Broadstairs was not only surviving but thriving. Numbers of members have been consistent over the past few years but there is no room for complacency and we should always be on the lookout for new members. This was echoed by Reg in his Treasurer’s report. The club made a slight loss last season but with sufficient assets it was decided to keep subscriptions the same and to subsidise the Christmas dinner as has been the custom in recent years. All the officials were re-elected en bloc and with the retirement of the President, David Horton, it was a unanimous decision to elect Reg Pidduck, in his fortieth year at the club, as his successor.